If you’ve ever gone to see the doctor and someone else handled your exam, you were probably seen by the nurse practitioner. Although not a licensed physician, the nurse practitioner is the closest thing to it. This is a highly specialized position that has gone through extensive training. An asset to the nursing profession, nurse practitioners pick up the slack in medical facilities and doctor’s offices by performing functions that extend beyond the usual duties of an RN. This position has required clinical training that is more detailed and intensive than that of a registered nurse. Nurse practitioners can also specialize in certain fields. This is a very lucrative career for the right person. A nurse practitioner is able to perform exams, order tests, lab work and x-rays, prescribe medication, administer immunizations, and diagnose different conditions. A nurse practitioner may see the patient before the physician to determine whether or not their illness is serious enough to be seen by a licensed physician. Many times, they are viewed as the family doctor. They are a registered nurse (RN), but much more advanced. They are able to interpret and explain test results to patients. A nurse practitioner is focused on overall health and wellness. For medical and clinical settings, the nurse practitioner is a cost-effective way to treat patients without tremendous overhead costs. In some states, a nurse practitioner can have their own practice. You will find nurse practitioners working in managed care facilities, hospitals, urban community health centers, colleges, employee health centers, medical offices, clinics and additional locations. Nurse practitioners also work for healthcare technology companies, governmental organizations, research facilities and health departments. 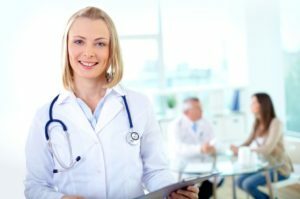 How much does a nurse practitioner earn? This is a very lucrative career path and is in high demand to fill the void of primary care physicians. In 2015, the median salary for nurse practitioners was $104,740. The highest paid professional earned $131,050, and at the low end of the totem pole, they still made on average, $68,000. The amount of pay depends on experience, education and location. Nurse practitioners make more than physical therapists, registered nurses and respiratory therapists. Working in a metropolitan city significantly increases the earning potential of this position. What types of skills are required to be successful as a nurse practitioner? Critical Thinking: A nurse practitioner must be able to think critically to determine the root of certain conditions. They must also be able to put themselves into the shoes of the directing physician to be able to have intelligent conversations when explaining the conditions and ailments of patients. Active Learning: The nurse practitioner must be an active learner on a daily basis, with the ability to quickly grasp new information and apply it as needed. This is helpful for future problem-solving and in making decisions. Good Judgment: Having good judgment is essential, as the nurse practitioner must be able to make good decisions. Communication: A nurse practitioner must have excellent communication skills. They must be able to speak clearly to patients and other healthcare professionals, conveying important information. This communication also translates into reading and writing. A nurse practitioner must be able to read well to understand research and concepts, and must be able to write well to disseminate the information needed to help patients with their ailments. Management: Proper management is essential. This includes management of personnel, files, software, medications and other aspects of the job. The nurse practitioner must be able to think well in their management practices, and be able to motivate and develop employees and patients. Technology: As the healthcare industry continues to evolve, the use of technology has become synonymous with the medical industry. A nurse practitioner must be able to successfully retrieve records using software, and properly use any medical equipment in the facility. All of these skills are an asset to this position, and will assist the nurse practitioner in being successful. Program requirements vary based on the program, but nurse practitioners are required to have an extensive number of clinical training hours in place before they are allowed to sit for the exam. There are also a number of research requirements needed to successfully complete the program. At least two years of clinical training is required, at a minimum. There are both educational and clinical requirements needed to be a nurse practitioner. The first step is acquiring a Bachelor’s of Science in Nursing (BSN) degree. This is a four-year course of study and requires passing the NCLEX-RN exam upon completion of the program. Once this is done, the student must pursue a Master’s of Science in Nursing (MSN) at the minimum. Most nurse practitioners have much more education beyond the masters. The BSN program has a number of prerequisite courses that take place within the first two years. These courses include chemistry, psychology, algebra, anatomy and physiology. The final two years include clinical internships and hands-on experience. Once an RN receives a Master’s degree, they can also teach at community and technical colleges. Most nurse practitioners complete the Doctor of Nursing Practice (DSN) program to properly position themselves for advancement and private practice. The requirements to become a nurse practitioner vary based on the state of residence, but mostly all states require certification through the American Academy of Nurse Practitioners, in addition to the American Nurses Credentialing Center. Nurse practitioners must also renew their certification every five years with the AANP, and every three years with the ANCC. These certifications require passing an exam to prove knowledge base and competency. Nurse practitioners have also been known to pursue their Ph.D. to become research specialists or tenured college professors, which is another avenue in this career, along with other opportunities for advancement. This is a very rewarding career path for someone who is interested in going beyond a standard nursing program. Nurse practitioners complete a number of tasks that are required by primary care doctors, and their education experience also gives them an opportunity to impart knowledge on others by becoming an instructor. It is a challenging career, but is very lucrative for the right person.